Learn more about your library, from 1875 to now. During the 18th century, due to the improvements made in printing methods, books had become more readily available. The first recorded library in Ontario was that of Newark (now Niagara-on-the-Lake) which was established in June 1800. It was a subscription library with an annual fee of $4.00 which, at that time, was a lot of money. *For more information, please read The Best Gift: a record of the Carnegie Libraries in Ontario by Margaret Beckman. Waterloo’s Mechanics’ Institute was formed in late 1875 when a group of interested citizens got together in the market, which at the time was located in the new Town Hall, built in 1874. On February 18, 1876, the first account for books was passed ($38.55) but the matter of shelving was laid over for consideration until after the town council election. In the meantime a table was provided and the books purchased by librarian David Bergey were displayed. So, Waterloo’s first library consisted of one table of books on the main floor of the Town Hall. There was a subscription fee of $2.00 per year to “join” the library. These monies were used to purchase more books and, eventually, shelving. The Library Room will be open from 7 to 9 o’clock on Tuesday and Friday evenings. German Books only will be distributed on Tuesday evenings. English Books only will be distributed on Friday evenings. No person under the age of fifteen years will be allowed to select books. Not more than two persons from one family will be allowed in the Library Room on the same evening. The utmost good order and decorum must be observed by all persons while in the Library Room. Smoking prohibited. Fifteen minutes will be allowed each party for the selection of Books, which when chosen, must be presented to the Librarian for entry in his books. Whether a selection is made or not, the party must retire at the expiration of fifteen minutes so as to give place to others. Any Book taken from the shelf and not selected must be put back into its place. The subscription fee was two dollars and subscribers were asked to state their preference of books written in English or German. Due to the public’s demand for better reading material and facilities, the Free Library of Waterloo was formed. Subscription fees were abolished and a Board of Directors was appointed. 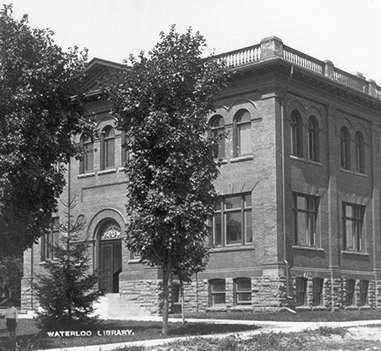 After twelve years, the Mechanics’ Institute decided to “…transfer its assets and liabilities” to the “Municipal Corporation of the town of Waterloo.” The Institute would become known as the Waterloo Free Library. No persons under the age of 15 were allowed to borrow books, and only 2 people from one family were allowed in the library at the same time. To quote from an article from the Chronicle Telegraph (now the Waterloo Chronicle) of November 19, “The necessity for new quarters for the Waterloo Public Library arose from certain conditions over which the Board of Directors had no control. In 1900 and the subsequent year the Education Department threatened to withhold the Legislative Grant if a more suitable reading room were not provided for the general public.” In the fall of 1901, the Library Board laid the matter before the Town Council and proposed a scheme. The plan was not favourably received for a number of reasons, including the worry that the Librarian would not be able to exercise the necessary supervision over the reading room. At this time the Waterloo Free Library’s collection contained 7,013 volumes. 6886 volumes circulated in 1901. Annual expenditures were $500. Waterloo’s population had increased to 3600 inhabitants. The Library Room in the old City Hall on Albert Street was no longer large enough. On July 18, 1902, the grant was approved. In 1848, Andrew Carnegie (pictured left) immigrated from Scotland to Pennsylvania with his family. His formal education ended upon immigration and, as a teenage telegraphic messenger boy, he borrowed books from a private library with a $2.00 annual subscription fee. Carnegie successfully argued that all fees should be eliminated and it became a free library. In 1901, Carnegie retired, having made his fortune in the steel industry, and devoted himself full-time to his philanthropic works. He felt the provision of a library to a community was the “best gift” that could be made. Over the years Carnegie, and later the Carnegie Corporation, donated over $56 million to build more than 2,500 public libraries world-wide, with over $2.5 million granted for library construction in Canada. A total of 125 libraries were built in Canada, with 111 of these being in Ontario. One being in Waterloo! Architect, Charles Moogk (pictured left) drew up plans for the Carnegie Library building, and submitted them to Mayor David Bean for approval. Charles Moogk was born in Preston in 1848, the son of Germany immigrants. As a young teen, Charles left school and began working. He developed an interest in carpentry and construction, spending several years both in Ontario and the United States honing his skills. He met his future wife Josephine Lockard in Philadelphia, and the couple moved to Waterloo in 1874. Through family connections, Moogk was hired to work on the building of the new Village Hall in 1874. Being involved with this prestigious building, now the site of the Marsland Centre, boosted Moogk’s career. Thanks to his considerable talent as an architect, as well as his integrity, promptness and reliability, Moogk became Town Engineer in 1899. He would be responsible for a number of buildings in Waterloo including the Waterloo Park Pavilion (1897) and the Carnegie Library in Waterloo! Property was purchased at Albert and Water (now Dorset) Streets. On November 12 the cornerstone was laid during a large, public ceremony. Within the cornerstone was laid a metal box containing copies of the local newspaper, the history of the Free Public Library (to date), a list of town officials and copies of correspondence concerning the Library. By December 25 the roof was in place and the interior work began. Emma Belle Roos (pronounced Rose) was the Waterloo Carnegie Library’s first librarian. She was born on November 15, 1880, one of eleven children. Her mother was Mary Ann Springer, a daughter of Moses Springer, one of the most influential citizens in Waterloo’s early history. Emma Belle was the Town Hall Librarian before taking on the new task of the Carnegie Library. As the new public librarian, Emma Belle Roos (pictured left) commanded an atmosphere of whispered silence, with no chatting, and demonstrative behaviour was frowned upon. For a number of years, she alone checked out books, did the re-shelving and carried out the ordering and cataloguing of new purchases. Her salary was $200.00 a year. She held this position for 46 years until her retirement in the summer of 1949. November 1 was the grand opening of the new Carnegie Waterloo Free Library. The new library cost $9,100 to build. The Library was 44 x 54’ and built in the Classical Revival Style. The exterior was constructed of red Milton pressed bricks, with a Credit Valley sandstone basement. The numerous large windows admitted an abundance of light into the interior. There was ornamental brickwork and pediment over the front entrance, the stained glass window to the east of the entrance, and a Bronze Honour roll on the south elevation. By 1909 the second floor was completed and served as a meeting hall with a capacity for 300 people. Books cost between $0.40 and $1.05; Ladies’ Home Journal was $1.65 for a one year subscription. On June 13, 1920, William Lyon McKenzie King spoke at a Library fundraiser, held at the town hall. A special section of the library was devoted to the younger readers. To encourage children’s reading, the first Story Hour was held. The program was a resounding success. 1300 books were being borrowed by customers annually. The Meeting Hall at the Free Library is renovated to become a Children’s Department and the first Children’s Librarian is hired. After 43 years, Chief Librarian Emma Belle Roos retires. Maureen Williams assumes the role of Chief Librarian. Elizabeth Christiansen takes on the role of Chief Librarian when Maureen Williams retires. Note: a Maureen Williams Memorial Fund was created at WPL in 2004 when she passed away in her 9oth year. This special fund will be used to support an expansion of the picture book collection. Elizabeth Christiansen retires (1960) and is succeeded by Charles Brisbain (pictured left). The Waterloo Lion’s Club donated time as well as $7000 to renovate the basement to become the Children’s Department. The Adult Department expanded to include the second story. In 1962, Waterloo Public Library becomes the first Library in Ontario to open on a Sunday. In 1963, Charles Brisbain retires and James Brown takes on the role of Chief Librarian. By 1964, the Library had again outgrown its location. The site chosen to build a new library was opposite the Carnegie Library on land which originally housed the old fire hall and Market House (Waterloo Market). Coincidentally it was in Market House that the meetings for the Mechanics Institute took place. On Jun 11 the new Waterloo Public Library opened at 35 Albert Street. The cost of constructing the new Library was $515,000. The two-story building, designed by architects Horton & Ball and engineers Walter, Fedy, McCargar, Hachborn, boasted 17,000 square feet of floor area, an auditorium-gallery, adults’, children’s and reference departments. The Carnegie building was occupied by the Waterloo Police Force (later the Waterloo Regional Police). After the Police moved to large offices on Erb Street, the building was (and still is) used by Habitat for Humanity Canada. On September 15, the Parkside Branch (later renamed McCormick) opened for business at 500 Parkside Drive. Combining a library with an arena/recreation centre was a new concept. The library starts holding an annual Summer Reading Club for Kids the following year. 24 children registered.Thirty years later, over 2000 children would be participating. James Brown retires as Chief Librarian and is succeeded by Isabel E. Staal. Staal was originally hired in 1972 as an Assistant Librarian. Report was submitted to City Council which stresses the immediate need for an expansion of the existing Library. The city’s population and the Library’s membership had doubled since 1966 yet the size of the building remained virtually unchanged. The City did not approve the grant for 1984, so a portable building was erected as a staff workroom, and the auditorium was converted to a Reference Room (in 1985). In 1986 a Library Needs Survey again recommended expansion and City Council granted approval. The Carnegie Library building was given a heritage designation. Construction on the expansion of the Main Library on Albert Street began in 1987 and was completed in the spring of 1989. The result was double the main floor (Adult Department) space, an audio visual department, a reference area, reading areas, and more room to display the books. With the expansion of the Main Library complete, Chief Librarian Isabel E. Staal announces her retirement and is succeeded by Joanne Tate (pictured left). The Parkside Branch was renamed the McCormick Branch. The card catalogue was replaced by a Dynix computer system at both the Main and the McCormick Branch. The Dynix system cost $616,000. Susan Low-Beer’s sculpture, Looking Outward & Inward (on the lawn at the Main Libary’s Dupont Street side) is not a complete narrative. It is ambiguous, exploring the relationship between men and women, but also the male and female within each of us. It can be considered contradictory, a reflection of a psychological state. Hopefully, each person will look inward and allow themselves to create their own story. Due to major cutbacks in funding, the library introduced the Adopt-a-Magazine program. Customers generously supported this new initiative, donating the cost of their favourite magazine’s subscription to ensure it would continue to be a part of the library’s collection. DialPAC was introduced. This computer service allowed customers to “dial in” directly from their home or office. This service proved very popular, with over 22,000 calls being logged and over 2,300 holds being placed. A partnership with David Chilton (author of “The Wealthy Barber”), RBC and WPL resulted in the acquisition of a new CD-ROM workstation at the Main Library. The Kiwanis Club of Waterloo North donated $15,000 to buy materials, shelving and technology for the new Children’s Literacy Collection. WPL’s 90 volunteers contributed approximately 8,700 hours of service. The Work Place at the Main Library, an area dedicated to providing current information and assistance to people seeking employment, expands to keep up with demand. 735 children registered for the Summer Reading Club and read almost 5,100 books. The Main Library launched “The Cancer Collection”, a selection of new books, cassettes and videos on traditional and alternative treatments for cancer. The mural in the entrance hall leading to the McCormick Branch was created in 1997 by the Waterloo County Tole and Decorative Painters Guild in celebration of their 10th anniversary. In September 1997, Waterloo Public Library lost a dear friend when librarian Anne Abohbot passed away. Among her duties, Anne was responsible for coordinating work with volunteers, developing audio-visual services, Visiting Library Service, books-on-tape, and large print book collections. Anne, along with Grete Pruefer, was instrumental in developing the “Cancer Collection” for the Library. As a tribute to this special woman, family, friends, and co-workers commissioned a stained glass window in her memory. Robert Brown of St. Jacobs designed and created the window, which reflects Anne’s love of gardens and of reading. On October 4, 1998 the window was unveiled in the Main Library’s reading area facing Albert Street. 826,000 items were borrowed by customers and 35,000 holds were filled. On an average day, 980 visit the library. WPL staff placed #1 in the Corporate Challenge at the Terry Fox Run. In the 5 years that WPL had a team in the Terry Fox Run, they raised over $7100 in pledges. In January of 1998, Waterloo Public Library lost a valued colleague when Community Relations Officer Grete Pruefer also passed away. Grete was a dynamic woman who was responsible for Library promotions and fundraising, as well as serving on the Children’s Circulation Desk at the Main Library. Grete was instrumental in developing both the “Work Place” collection and, with Anne Abohbot, the “Cancer Collection”. As the Library’s appearance and image was so important to Grete, we decided to have a memorial garden planted in her honour. The garden reflects the image created in Anne’s window, which is fitting as they were close friends. The City of Waterloo’s Parks Services Department generously donated the design, labour, and materials. Family, friends, and co-workers purchased two simple yet elegant reading benches for the garden. On October 4, 1998 the garden was dedicated in Grete’s memory. Grete’s Garden is located beside the sidewalk at the Albert Street entrance of the Main Library. Over 900 children registered for the Summer Reading Club and read over 9000 books. 139 volunteers worked over 2360 hours shelfreading (putting books in order), shelving, covering book and delivering books to people who are unable to visit the library themselves. Free Internet service became available in all departments. - Six (6) new computer workstations (donated by the Bill and Melinda Gates Foundation) were available to customers. These stations provide such software products as MS Word, Excel, Publisher, PowerPoint and more. 1000 children registered for the Summer Reading Club and read over 10,000 books. Waterloo Public Library celebrates its 125th anniversary. In honour of the library’s 125th anniversary, calendars, note cards and book bags were designed and sold as a fundraiser in 2000 and 2001. Over 1100 children register for the Summer Reading Club and read almost 12,000 books. In the spring of 2001, WPL’s new computer system, shared with Kitchener Public Library, was launched. The majority of the new computers are also connected to the Internet. The library starts offering free, one-on-one computer tutoring. On June 29, 2001, WPL’s first web site was launched. Chief Librarian Joanne Tate retires at the end of the year and is succeeded by Cathy Matyas (pictured left). Over 1200 registered for the Summer Reading Club and read over 13,300 books. The WPL Book Club holds its first meeting. Customers borrowed almost 884,000 items. WPL is proud to participate in the 1st annual One Book, One Community reading program. The selected book is “No Great Mischief” by Alistair MacLeod. The library offers free one-on-one assistance for those looking to create or improve a resume. WPL’s 160 volunteers donated 2700 hours of their time. There is a major redesign and reorganization of the Main Library. The Children’s Department receives the first treatment, with a cheerful new colour scheme, a revised layout plus new bookshelves and furniture to suit their smaller customers. The library adds DVDs to its lending collections. The /4teens section of the library’s website is launched. The circulation desks are moved to a more central location, the Dupont Street lobby. Staff and customers contribute recipes to create a fundraising cookbook titled “Literally Delicious”. By the end of 2004, over 1000 copies had been sold. On February 21, 2005 the Waterloo Public Library Board presented recommendations to Waterloo City Council for library expansion. These recommendations were approved by Council. The redesign project at the Main Library continues with the Adult Department drastically changing the layout, plus purchasing new book shelves to hold the thousands of wonderful new books which are arriving weekly. In November, with support from the Optimist Club, a Toy Lending Library was officially opened at the McCormick Branch. The website receives 430,000 visits annually. A popular new section of the website is the “eBranch”. City Council approved a report from the library board to secure a site on Fischer-Hallman Road North in Waterloo to built a 21,000 sq ft. branch library. The library received special funding from the Waterloo Regional Heritage Foundation to create and publish a book highlighting 150 people, historical and contemporary, who have made Waterloo the wonderful city it is. The book will be published to co-ordinate with the City of Waterloo turning 150 in 2007. WPL was shortlisted for the Minister of Culture’s innovation award for its use of blogs to share information and to educate the community on new technologies. Over 1600 people visit the Waterloo Public Library daily. Over 1 million items are borrowed by library customers annually. “Profiles of the Past, Faces of the Future” is published. The book celebrates 150 local people, historical and contemporary, who helped shape our city. WPL holds a photo contest for kids. The winning photos, which are to depict what they love about Waterloo, were made into greeting cards which were sold in-house. The redesign project was completed. The Main Library and the McCormick Branch received new carpeting, furniture, paint and signage. As part of the redesign, murals at the Main Library (in the Children’s Department, and in the Adult Department by magazines and by CDs/DVDs) were created by two Conestoga College students. The murals were the result of a partnership between WPL and the Graphics Design class at Conestoga. Amy Rayner designed the murals in the Children’s Department, and Phillip Novak, the Adult Department. The Library was even busier than in 2007, with 1700 people visiting each day to use the various services offered by WPL, and to browse the 250,000 + items on the new shelves. The WPL web site, after 8 years, has been completely redesigned with input from the general public. The system for checking out and in books changed over to RFID technology and self-serve checkout stations were installed at both the Main Library and the McCormick Branch. WPL holds the Country Musicians Rock n Read for Kids fundraising auction on eBay. Country performers including Luke Bryan, Kenny Chesney, Lady Antebellum, Brad Paisley donated autographed items. Over $4000 was raised. The groundbreaking ceremony for the new John M. Harper District Branch Library took place in the autumn. Construction of the new John M. Harper District Branch Library continues at 500 Fischer-Hallman Road North in Waterloo. Laurie Clarke (pictured left) is hired as the new CEO (Chief Librarian) of Waterloo Public Library. 88,500 holds were submitted on books, DVDs, CDs etc. Musicians Rock & Read for Kids charity auction on eBay was held in support of children’s literacy collections at the library. Donors of autographed items included Sugarland (who donated a signed guitar), Tim McGraw, Elvis Costello, The Canadian Tenors, Duran Duran, Dolly Parton and Jason Mraz. Totem: Youth Ceramic Public Art Project 2010, was directed by a community artist mentor Mary Catherine Newcomb and the Canadian Clay & Glass Gallery’s Director of Education Sheila McMath. This project provided nominated high school students interested in the realm of public art the opportunity to construct a collaborative artwork. The artwork on display in the Main Library (from 2010 to 2015) was created incorporating a modular system of construction with many smaller units assembled into the larger totemic works. Sponsored by: Waterloo Public Library, Region of Waterloo Arts Fund, Pottery Supply House, Canadian Clay & Glass Gallery, Musagetes Fund of the Kitchener Waterloo Community Foundation, Community Fund of the Kitchener Waterloo, and Community Foundation. October 22, 2011 – the John M. Harper District Branch Library opens at 500 Fischer-Hallman Road North in Waterloo. This 21,000 sq. ft. “green” building saw over 500 people line up to be one of the first to cross the threshhold. In the first 3 hours of opening, almost 3000 items were checked out and 89 new members registered for library cards. In the first 2 weeks, over 400 new memberships were registered. The Reading is Child’s Play auction of autographed sports memorabilia as well as game tickets was held on eBay. Donors included Brian Boitano, the Buffalo Bills, Cassie Campbell, the Detroit Tigers, ESPN/Disney, the Hamilton Tiger Cats, Hayley Wickenheiser, Joannie Rochette, Lleyton Hewitt, Tony Hawk, the Toronto Maple Leafs, and more. Almost $2000 was raised for the children’s literacy collection at WPL. On average, 2,330 people visit WPL each day; an increase of 15% from 2011. Customers borrowed 2, 020, 580 items. Staff answered 41,900 reference questions. WPL releases its second community cookbook, “Fact. Fiction. Feast.” which includes over 400 recipes from staff and customers. 165 volunteers work over 4,220 hours each year at WPL in a large variety of tasks. Thank you! Programming for teens, adults and seniors is re-introduced at WPL. Programs for children and tweens are as popular as ever. WPL’s website has a new visual design specific for Smartphones. Transformation Station (pictured left), the Strat Plan launch event, attracted over 1500 people to the Main Library. Over 741,600 people visited the library in person, and over 810,900 visited virtually. WPL has over 63,800 active members. Over 1,967,250 items were borrowed by WPL customers. 33,524 people attended the 1800 programs which were held. 2005 children registered for the Summer Reading Club for Kids. WPL held its 1st annual Waterloo Reads! Battle of the Books at the McCormick Branch. The winner was Deputy Fire Chief, Richard Hepditch. Our 168 volunteers donated over 4300 hours to WPL. Over 1.8 million items were borrowed by WPL customers. WPL held its 2nd annual Waterloo Reads! Battle of the Books at the Waterloo Memorial Rec Complex. 150 people attended. The winner was singer/songwriter/children’s entertainer, Erick Traplin. In February, a sock drive for the homeless was held. Customers donated over 350 pairs of socks. In October, WPL’s McCormick Branch hosted a citizenship ceremony. This is the second time WPL has had this honour. The 1st annual After Hours @ The Library (pictured above) fundraiser was held in November. Guest speakers included Richard Hepditch (Fire Chief, Waterloo Fire Rescue), Terry Salmond (Chef), Laura Archibald (Filmmaker) Mike Kirkup (Velocity @ U of W), Syd “The Jewel” Vanderpool (former pro-boxer), Carrie Snyder (author), and Jennifer Moss (Smile Epidemic & Plasticity Labs). Food stations were sponsored by 7 local restaurants. Many business and services donated draw prizes. Monies raised allowed WPL to purchase a 3D printer which would be shared between the 3 locations. Over 900 customers replied to a survey and took part in focus groups, helping WPL to reimagine its logo and image. In June, the new WPL logo and brand were launched. In February, the 2nd annual Toasty Toes Sock Drive for the Homeless was held. Over 700 pairs of socks were donated by customers. STEAM heat! (formerly Transformation Station) was held at the Main Library with over 1000 people attending. There were a variety of hands-on stations, demonstrations, live music and food trucks. WPL held its 3rd annual Waterloo Reads! Battle of the Books at the Waterloo Memorial Rec Complex. 200 people attended. The winner was Wendy Tutt, co-owner of The Princess Cinemas. The 2nd After Hours @ The Library fundraiser was again a success. 200 people attended. Guest speakers included John Neufeld (House of Friendship), Meaghan Coneybeare (youth advocate), Lisa Grogan (entrepreneur) and Tasneem Jamal (author). Food stations were sponsored by 10 local restaurants. Many business and services donated draw prizes. Monies raised will allow WPL to purchase a green screen and a digital conversion workstation. WPL launched its redesigned website in August. The library's first website was launched in June 2001, followed by a redesign in 2009. The latest site includes a custom-designed mobile site as well. Waterloo Reads: the battle of the books was held in October during Ontario Public Library. The 2015 champion, Wendy Tutt, held onto her title, winning in 2016 by defending Plum Johnson's memoir, "They Left Us Everything". Over 200 people attended the debate. In October, the 3rd annual After Hours @ The Library fundraiser was once again a huge success. Attendees enjoyed delicious food provided by local restaurants, won amazing prizes donated by local business, and heard from 3 engaging guest speakers. To learn more, visit After Hours @ the Library. We held our annual Toasty Toes Sock Drive for the Homeless. With the help of local students and businesses, over 2000 pairs of socks were donated. The socks are distributed by St. John's Kitchen to those in need in our community. In January, Chatelaine Magazine named WPL's John M. Harper Branch to its list of "The 15 Coolest Libraries in Canada." Over 61,000 members borrowed over 1.5 million items this year. We have over 7000 new adult members and almost 1500 new children's memberships. 1528 free programs and events were held for customers, with 42,525 attending. Over 2000 children participated in the annual Summer Reading Club for Kids. The 4th annual After Hours @ The Library event raised over $8500 for technology-related items for adult and children's programs. WPL's new "Maker Biker", a portable makerspace, is launched, visiting various community-led events across Waterloo. Our Explore Play Learn early literacy initiative receives the 2017 Public Library Service Award - Angus Mowat Award of Excellence for all of Ontario. 138 volunteers dedicated over 4300 hours to helping, teaching and inspiring at WPL. - custom “book benches” were donated to the Main Library by Frank and Dolores (Dorscht) Steffler in memory of their parents, Leander and Rose (Dietrich) Steffler and John and Mary Ann (Mahlman) Dorscht. The benches, made from concrete and beautifully sculpted to look like open books, arrived at the Main Library in early summer and were embraced enthusiastically by staff and customers alike.